Saturday I had lunch with 2 of my favorite local bloggers, Kirsten and Christine. After lunch, we went food shopping, of course! One of the things I picked up was some lovely fresh halibut. I knew that I wanted to do something that would showcase the fresh fish, but in a way that I could also use some of the Black Forbidden Rice that I found in San Francisco. Scott suggested we cook the fish en papillote, which is a fancy way of saying, wrapped in parchment paper packets. I love the moistness that this preparation method gives to fish when grilled. I marinated it for about an hour before we put in the parchment packets. I played around with adding ingredients that would give it an Asian flare. 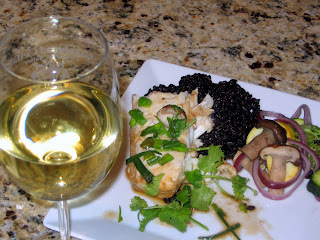 Using such healthy ingredients, I thought it should be called the Antioxidant Asian Halibut. The black forbidden rice was done in the rice cooker with 2 parts green tea, to 1 part rice. And now, on to the wine. I have always enjoyed the Rosenblum reds. I love their jammy zin, not to mention their petite syrah! But,I've never paid much attention to their white varietals. A couple of weeks ago, while strolling the aisles of BevMo, I found this bottle. I asked the gentleman that was stocking the shelf behind me what it was. He explained it was a blend of viognier, roussanne and sauvignon blanc. Since I really enjoy viogniers, I was intrigued. I have to admit, before I opened the bottle on Sunday afternoon, I was skeptical. It might be a bit heavy or aromatic for the dinner I had planned. I took one for the team and poured a glass for myself. (The things I do - sacrifices, sacrifices!) It was perfect. Just enough floral undertones to remind you of the viognier, but less heavy - from the addition of the sauvignon blanc. Not only would it match the meal, but hit the spot on this record breaking hot day. Marinate the fish in the first 7 ingredients. Put one fillet in each parchment packet and top with some of the marinade. Fold up and grill for approx. 10-15 minutes over medium high heat. (If you prefer not to do en papillote, put in an aluminum foil pan and cover with a piece of aluminum foil, adjust cooking time appropriately.) Garnish with additional sesame seeds, green onion and cilantro. Yum! I haven't cooked "en pappiote" yet so this may be what I do for my leftover halibut. I really like the marinade. That looks sooo good! Was the rice better this time?